. The Ismaili merchants of Kirman are said to have built a small palace for Nizar in Kahek, which became known as Kahek-i Shah Nizar, where a small marble platform had been erected in a garden, facing the palace. It is said that the Imam would sit on this platform, which was surrounded by water, when giving audience. His guests would be placed amid flower beds on the other side of the water. Kahek, or Kiagrak is situated about 35 kilometers northest of Anjudan and north-west of Mahallat. Sad shukar  ke  dar alam'e tahaqiq nazaram. means, "Although I am looking weak in the eyes of the people, but it is a matter of thank that I am watching the world of reality." Kaz rah'e jalal'e nasab akbaraz'e kibaram. means, "Physically, I am looking weak and small in size, but I am not so in reality. Because of the dignity of my (illustrious) linage, I am greater than the greatest ones." The Safavid Shah Abbas ruled Iran from 995/1588 to 1038/1628. He restored peace with severe actions. He reduced the number of provincial governors to curb the power of Kizilbash, and took punitive action against them for their disloyalty. Shah Abbas also turned to the third force, which Shah Tahmasp had introduced into the state, and created their regiments which constituted the nucleus of a standing army. He also took the power of collecting revenue from the Kizilbash, and demanded accounts of expenditure from his governors. 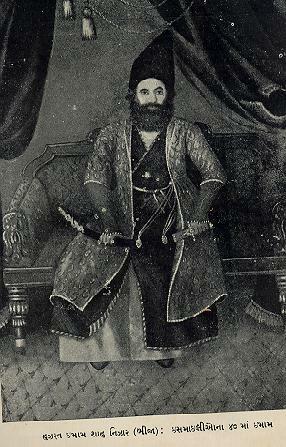 The chief of the Ustajlu faction in Khorasan, Murshid Quli Khan, was a powerful Kizilbash leader, who was responsible for placing Shah Abbas on the throne; had assumed that, as in the past, he would be able to bend the king to his will. Shah Abbas had him executed in 996/1589. Hence, the Uzbeks overran the province of Sistan, and invaded Mashhad, but it had been repulsed. In 1005/1598, Shah Abbas transferred his capital from Qazwin to Ispahan. He expanded his influence in Herat and defeated the Uzbeks, and annexed Balkh in his state. In 1014/1605, he attacked on the Turks and recovered Tabriz. Shah Abbas is noted as a great builder, and so was very cruel. In 1024/1615, he executed his son, Muhammad Bakir, the then governor of Khorasan. His another son Hasan predeceased him. In 1030/1621, when he fell ill, his third son Muhammad prematurely celebrated his death. When Shah Abbas recovered, he blinded Muhammad. In 1035/1626, he blinded his only surviving son, Quli Mirza. Hence, he had no male issue to succeed him. He died in 1038/1629 after ruling for 42 years, and was succeeded by his grandson, Sam Mirza, surnamed Shah Shafi, the son of Muhammad Bakir. The Ottoman empire was sunk into the internal disputes after sultan Suleman, and lost many regions from the Safavids. Unemployment, poor exports and the worsening condition of the peasants had badly paralysed the economy of Turkey. Earlier, the Europe and United States imported silver from Turkey for minting coins, but now they began the coinage with other cheap metal, causing heavy loss of mine business in the country. The Safavid Shah Abbas used to export the silken costumes and carpets to Europe through the port of Turkey, but it was stopped because of the newly formed Port Abbas in Iran, resulting another heavy crack in the tax-income of Turkey. In sum, the Ottoman empire began to come in its ebb. Bayazid Ansari (1525-1581), known as Pir-i Rawshan originated a Roshaniyya cult in Kabul and Kashmir. His works, "Khayr al-Bayan", "Maksud al- Muminin", "Surat-i Tawhid", "Fakhr", "Hal-Nama" etc. were rigorously opposed by the Sunni ulema. The Mughals persecuted his followers and executed many of them. It must be known that the Ismaili mission had no relation with the Roshaniyya sect, but Bayazid Ansari seems to have been influenced with the esoteric doctrines of the Ismailis in Kandhar. Nevertheless, a bulk of the Ismailis were also scourged to death in Kashmir during the Mughal operations, forcing the surviving Ismailis to migrate to Punjab, where they emerged under the name of the Shamsi. The Shi'ism dominated in Iran with the foundation of the Safavid kingdom and brought forth many eminent scholars and theologians, viz., Mulla Muhammad Amin Astrabadi (d. 1033/1623), known as Mir Damad, who compiled many works on Shiite jurisprudence, and founded a thought, known as Akhbari against those Shias, who professed the doctrines of Ijtihad. The Akhbari group adhered only to Holy Koran, Hadith and the sayings of twelve Imams being the source of authority. In contrast, the other Shias, known as Usuli believed in Holy Koran, Hadith and Qiyas. They used to debate each other, and their polemical writings had become a major industry in Iran. This period is also noted for the introduction of marsiya (mourning songs) and the commemoration of the rawda-khani (recital of the martyrdom of Imam Hussain) during Muharram. In addition, the ilm al-kalam (theology), hikmat (wisdom), irfan (gnosis) and the Sufic thought also accelerated. Iran was a fertile land to nourish philosophy and wisdom, and gave birth of prominent scholars, viz., Ibn Turka Ispahani (d. 835/1431), Sayed Hyder Ali Amuli (11th/16th cent. ), Mir Dad (d. 1041/1631), Muhammad Bakir Majlisi (d. 1110/1699), Mulla Sadra (d. 1050/1640), Mohsin-i Fayd Kashani (d. 1091/1680), Abdur Razzak Lahiji (d. 1072/1661), Rajab Ali Tabrizi (d. 1080/1699) etc. Roger Savory writes in "Iran under the Safavids" (New York, 1980, p. 91) that, "We have seen the period from the establishment of the Safavid state in 1501, upto the accession of Shah Abbas I in 1588, was one of change and experiment. An attempt was made to incorporate the original Sufi organization of the Safavid Order in the administrative structure of the state." Thus, under Shah Abbas, the Sufism came to life once again.